Could you use a little help with your kid’s birthday party? We’re parents too, and we know that finding a kids’ birthday party place and gathering up everything you need and finding the right invitations and picking a theme and…well, you get the picture; it’s insane! So, with so much to do, how can a kids’ party place like Hot Ground make ourselves stand out? Well, beyond simply giving the kids activities that they actually want to do, we also make sure to make life as easy as possible on parents. 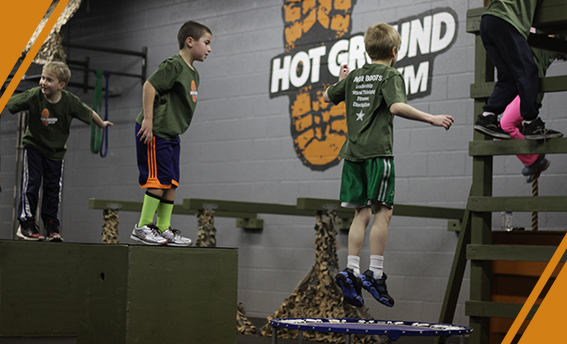 Here are a few ways that your life gets a lot better once you decide on Hot Ground Gym. What’s one way we make your life easier when you’re dealing with a kids’ birthday party place? We provide the invitations! All you have to do is click this link to download the invitation. It not only provides the basic information to fill out, but already has many important information points about each guest’s visit to Hot Ground Gym — what types of shoes to wear, name and address of the party place — preprinted on the invite. You’ll save money and time! Sometimes your child is going to have a very specific interest in the theme of the party. This usually happens with young children who are most interested in the latest Disney property. You can certainly bring those decorations if you’d like, because arguing with a child who’s on their thirds year of a Frozen obsession is probably a lost cause. But as kids get older, themes get harder and harder to nail down. Sure, they have interests in the latest bands or video games, but you’re not going to find a lot of middle-school themed paper plates and cups at the local party store! That’s where we take over, because we already have the American Ninja Warrior theme covered! So, the invitations are taken care of. The theme is decided. You just have to gather up everything and bring it in, right? Well, once again, we have you covered! Hot Ground Gym will provide the tablecloths, plates, napkins and utensils. Sure, you can bring extra items in like balloons and streamers, but we’ve got all of the basic cake-eating implements ready for your party! So you’ve spent a couple of weeks planning the party (which was easy, as we hope the previous three points made clear! ), and now it’s time for clean-up. No worries, because we’re going to take care of that for you! You can bring your cake and drinks in, take advantage of our setup, and now we’ll handle the cleanup as well. Birthday party ideas can wear pretty thin here in Northbrook after a while. If you’ve already decided against having your kid’s birthday party in your home and are tired of the many other options that have been exhausted (by you and other parents) over the years, Hot Ground Gym and our American Ninja Warrior gym for kids offers something new that many parents don’t know about. They’ll be more than happy to find out about us so that they have one more great option for their own kid’s next birthday party! What’s the best kids’ birthday party idea around? The theme matters, but making it easy on you is the best idea around! Find out more about our American Ninja Warrior birthday parties right here.